Whether it is the distraction of phone calls, emails, or checking texts or Facebook on our iPhone, we always seem to be doing two things at once. However, scientific studies have shown that we are not really doing two things at once. We are just flipping constantly between doing one thing at a time without giving our full attention to either. 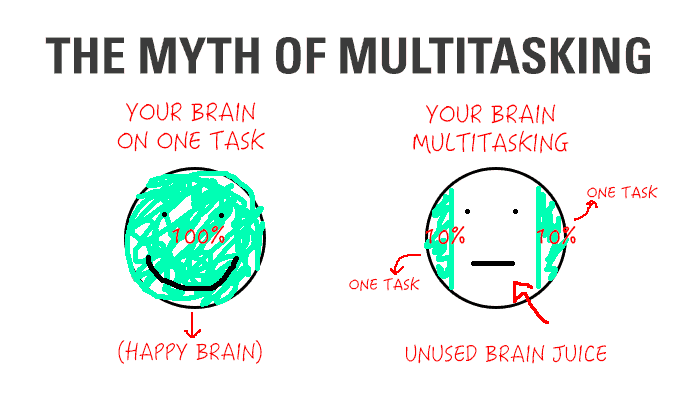 An American Psychological Association article summarized a number of studies that show multi-tasking reduces productivity and increases the risks of error. 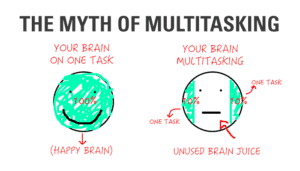 An article written by Dr. Travis Bradberry, award-winning co-author of the #1 bestselling book, Emotional Intelligence 2.0 (non affiliated link), summarizes Stanford University research, and other research, that shows multi-tasking can cause brain damage and lower your IQ. If these reasons and research aren’t enough to make you stop, then I have one more BIG reason. It’s common courtesy. When you answer a call you have made the decisions that the person calling you is worthy of your attention. If you’ve invited someone, or accepted an invitation from someone, to have a cup of coffee, you’ve made a decision the other person is worthy of your attention. Once these decisions are made, give him/her the courtesy of your full attention, not intermittent periods of attention. No one wants to play second fiddle to an electronic device. And finally, if all this doesn’t convince you, how do you feel when you know a person is multi-tasking and not give you their full attention? So, as I stated in number 36 in my post, 52 Ways to Make 2018 Your Best Year Ever, celebrate today by single tasking and you will find you actually get more done than trying to do two things at once.